This article is about the character from the Transformers franchise. For the 2018 film, see Bumblebee (film). In most versions, Bumblebee is a small—yellow with black stripes—with most of his alternative vehicle modes inspired by several generations of the Chevrolet American muscle cars – with the live-action film versions being a yellow Camaro with black racing stripes. The original vehicle-mode design was based on a classic European Type 1 Volkswagen Beetle. The character is named after the Bumblebee, a black-and-yellow striped bee which inspired his paint scheme. Bumblebee appears in most of the series and later becomes the main protagonist in Transformers: Robots in Disguise, Bumblebee, and Transformers: Cyberverse. Bumblebee (known as Abejorro in Mexico, Bumble in Japan, Moscardo in Portugal, Űrdongó in Hungary, Maggiolino in Italy, Bourdon in France) is the "little brother" of the heroic or protagonistic Autobot faction and a mascot, constantly striving to prove himself in the eyes of the other robots—especially his leader, Optimus Prime. This often causes him to take risks that put him in danger. Although a bit of a smart aleck, he is a capable and reliable messenger and spy, his small size allowing him to go places that his larger commanders cannot. He is highly fuel-efficient, has great visual acuity, is particularly adaptable to undersea environments and transforms into a Saturn yellow Volkswagen Beetle. He was later reconstructed into a stronger, more mature form as Goldbug. At BotCon 2010, Hasbro named Bumblebee as one of the first five robot inductees in the Transformers Hall of Fame. Bumblebee holds the distinction of being the second character to appear on-screen in the original Transformers animated series, while on a mission to recover a small clutch of energy conductors with Wheeljack, illustrating the energy crisis holding sway over their home planet of Cybertron. These two characters were often season and beginning of the second season, sometimes going on missions. Bumblebee is subsequently among the Transformers aboard the Ark as it set off searching for new worlds and new energy sources, which crashed on Earth, causing the Transformers within to be trapped in stasis for four million years. Awakening in 1984, Bumblebee helps Ironhide quell a raging river and uses his small size to help the human Autobot ally Sparkplug Witwicky plant explosives in the midst of a Decepticon mining operation. He later befriends Sparkplug's son Spike, but on their first adventure together they are both kidnapped by the Decepticons, and Bumblebees memory chip were altered as he unintentionally lured the other Autobots into a trap. Bumblebee recovered in time to help his fellow Autobots stop the Decepticons from sending Spike to Cybertron. After their first adventure, Bumblebee and Spike became best friends for life as they both realized that they make a good team. Bumblebee got injured with Spike inside from a battle with the Decepticons at a rocket base. Bumblebee was being repaired by Ratchet while his best friend was being fixed at the hospital but his mind ended up being transferred into the robot body of Autobot X, created by Sparkplug, so the doctors at the hospital can operate one his real one. When Spike left base as there was a side effect of the mind transfer, Bumblebee left afterwards to go look for his best friend but his radio transmitters weren't fixed yet. After finding Spike, Bumblebee tries to get his pal to come to his senses but failed when his best friend believed that he was tricking him. Bumblebee sees the Decepticons arriving at their location but they didn't see him so he was able to hear Megatron tell lies to his best friend then left to go get Optimus and the rest of his Autobot friends for help, who were helping with repairs at the rocket base they were battling at before. After arriving at the rocket base, Bumblebee tells Optimus that Megatron is manipulating Spike and he's starting to believe him. Bumblebee was asks to lead the way of their location by Optimus, who feared that the Decepticons would find out about Spike's messed up mind and would take advantage of the situation, so they can help their friend. Arriving where Spike was, Bumblebee and Optimus tried talking some sense into him but it didn't work as they hoped it would but they were both relieved when he did when Sparkplug was endangered. After the Decepticons left, Bumblebee gave his best friend a high five when he returned to his real body when it got all fixed up. Bumblebee accompanies Spike and Sparkplug with Jazz to test out his new speakers but decided to head to headquarters so wouldn't have to deal with his loud music. When Bumblebee return to headquarters he saw no one but Bluestreak there and that Telatran One was damaged then was dragged to the recharging chamber by Bluestreak, due to Megatron putting a personality destabilizer in their recharging chamber to turn all the Autobots evil. However, Bumblebee was saved when Jazz, Spike and Sparkplug arrived back just in time as Jazz knocked Bluestreak out for a while. After Sparkplug fixed Telatran One, Bumblebee, Jazz, Spike and Sparkplug became shocked when Telatran One tells them that Megatron turned their friends from good to evil. With Bumblebee and Jazz being the only ones who weren't affected from the personality destabilizer. Bumblebee decided to stop his comrades when he hears about Optimus Prime with Brawn and Prowl attacking an Air Force jet base with Spike accompanying him. Once they arrived, Bumblebee tried a few times to get through to Optimus but to no success. Bumblebee was relieved that his friends were free from the Decepticons control, after Sparkplug invented Attitude exchanger to counteract the personality destabilizer effects, except for Optimus. Bumblebee took the last one, as there was no other ones left, as he wanted to make one final attempted to get Optimus back to his senses. Bumblebee tells his friend/leader that he's not evil and he believes in him then encourages him to fight off Megatron's control also to not give in. Bumblebee quickly put the Attitude exchanger on Optimus, who heard his voice, leg which freed him from the Decepticons control. Bumblebee was given a hug by Optimus as a thank you for not giving up on him and for saving him. After stopping the Decepticons, Bumblebee was thanked again by Optimus, who also thanked everyone for their help, for what he did for him. Bumblebee with Spike gave Ratchet and Sparkplug tools as they them to fix the Air Force jets the Autobots destroyed while under Megatron's control. Bumblebee befriends a girl named Carly, who admires the Autobots. While testing out one of Wheeljack invention, Bumblebee fought the Decepticons as they wanted to steal it which they succeed in doing. After the battle, Bumblebee and Spike went looking for Carly, who left base to help them as she believed it was her fault that the Decepticons got the invention because of her due to being there when they were testing it. Bumblebee and Spike found Carly with Ironhide, who was the one who rescued her from the Decepticons, then left but they didn't get very far when they saw that their friend wasn't behind them. Transforming back into robot mode, Bumblebee wondering what was going on then saw that Ironhide was immobilize. After the rest of the Autobots showed up, Bumblebee with Spike and Carly hid then all agreed that they had to do something. Bumblebee signal Jazz to do his sound and light show which distracted the Decepticons so Carly can reverse the process of Wheeljack invention. After the battle was won, Bumblebee encourage Spike to ask Carly out knowing that they have feelings for one another then witness them drive off together. When the body of the deceased Optimus Prime is recovered from space by a pair of Transformer-hating human scientists who intend to use it to lure the Autobots into a trap, Bumblebee is part of the rescue team led by Rodimus Prime to recover it. Entering the lab, some of the Transformers are exposed to rage-inducing alien spores that could infect them with the Hate Plague, which causes them to run wild, and although Bumblebee avoids infection, he is seriously damaged by the infected rampaging Superion. A member of the alien race called the Quintessons subsequently repair and restore Optimus Prime to life, so he can stop the Hate Plague and repair Bumblebee. The little Autobot was so severely damaged that he required an entire reconstruction and is rebuilt as a Throttlebot. In his new, shiny body, he comments that he has gone beyond just being plain old Bumblebee, and is now a "gold bug", prompting Optimus Prime to redub him Goldbug. Goldbug travels with Optimus Prime to the Decepticon planet of Chaar in order to secure a heat-resistant alloy that can protect him from the plague, only to be infected on the mission and later cured when Prime uses the power of the Matrix of Leadership to purge the plague. Both Bumblebee and Goldbug also make a brief appearance in the fourth and final season of the series, defending Autobot City and Cybertron against a massive Decepticon attack. Because of an animation error, Bumblebee appears in a wide shot in a celebration alongside with Goldbug during the series' final episode. In Transformers: The Headmasters, Goldbug and the other Throttlebots were on Cybertron when Vector Sigma began to destabilize as a consequence of Optimus Prime releasing the Matrix's energy to cure the Hate Plague the previous year. The Decepticons soon invaded the planet in an attempt to take control of the computer, and Goldbug and the Throttlebots joined Dinobots Grimlock and Slag in holding the line against them. Unfortunately, they were knocked unconscious by the hypnotic power of the new Decepticon Headmaster Mindwipe, but they had managed to delay the Decepticons long enough for the Autobot Headmasters to arrive and take up the fight. The Throttlebots disappeared after this encounter, suggesting they might have been destroyed, but they eventually resurfaced months later as the Decepticons were carrying out their final plan to destroy the Earth. Goldbug and the Throttlebots teamed up with Fastlane and Cloudraker to investigate the emergence of a "Death Tower" in Santiago, Chile, only to find Predaking there waiting for them. Naturally, the small 'bots were no match for the powerful combiner, but they fought bravely, clinging onto his limbs before being hurled aside. Luckily, the Autobot Targetmasters arrived in time to bail them out and take Predaking down. This is also because of the budget cut that happened in the middle of the movie. Bumblebee was featured in the 1985 Find Your Fate Junior books Dinobots Strike Back by Casey Todd and Battle Drive by Barbara Siegel and Scott Siegel. Bumblebee was featured in the 1985 audio and book adventure Satellite of Doom publishing by Kid Stuff Records & Tapes. Bumblebee was featured in the 1993 Transformers: Generation 2 coloring book Decepticon Madness by Bud Simpson. Bumblebee has appeared in numerous comic books and related media printed by various publishers. Bumblebee appeared in the voice actor play performed at BotCon 2004, in which a device built by Rhinox to stop Unicron from pulling victims from other dimensions inadvertently transports an Autobot shuttle under Bumblebee's command into the middle of a battle between Rattrap, Silverbolt, and Waspinator and a team of Unicron's agents. Bumblebee's shuttle is able to scoop up Rattrap and company when their ship is destroyed. After saving more of Unicron's victims from the Decepticons, Bumblebee's team returns to their own time. In a story called "By their Blasters you shall know them ...!" from Transformers Comic-Magazin issue #12 by German comic publisher Condor Verlag Optimus Prime instructs Backstreet, Bumblebee and Ruckus on how to identify Autobots from Decepticons in battle using the Ark's computer. Pretender Bumblebee is one of those he displays to the Autobots. In Devil's Due's first G.I. Joe vs. The Transformers crossover, the evil terrorist organization Cobra are the first to uncover the Ark and the Transformers slumbering within it, capturing and reformatting a large number of them to use them as war machines. Bumblebee and Wheeljack are able to avoid this fate, contact the team created to respond to the threat of Cobra, G.I. Joe, and help to free their fellow Autobots. Unlike most Autobots, who had new alternate modes, Bumblebee and Wheeljack had their original Generation 1 alternate modes in this series. 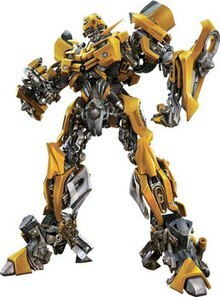 In the second crossover, Bumblebee is among the Autobots sent back in time due to an accident with the spacebridge computer Teletran-3. As part of a small group transported to the 1970s, Bumblebee is reformatted as a small economy car (this time, resembling an AMC Pacer) before the teamed-up Joes and Cobras return all the Transformers to present-day Cybertron. Bumblebee takes center stage in the third crossover series, as he, Grimlock, Arcee, and Perceptor are sent to Earth to aid G.I. Joe in removing the influence of Cybertronian technology on the planet. Sporting his original alternate mode again, he is shown to have something of a crush on Arcee. When Cobra attacks the base, the Autobots help repel the Cobra Battle Android Trooper armies. Journeying to Cybertron to stop Serpentor, the mismatched group is ambushed first by Cannibalizers, then by Serpentor, Piranacon, Predaking and the Stunticons, with Bumblebee being badly injured as he runs right into Predaking's leg. He is then executed by Serpentor, who would later comment that Bumblebee's death is the only thing that ever really made him feel emotion. Despite the character being notoriously difficult to kill, it seems his death is permanent, as Serpentor comments that he felt something leave him, most likely his spark. A statue to his memory was seen in the final issue. His death would continue to have repercussions, as seen in the fourth series, in which Prime insists on journeying to Earth personally rather than expose any of his troops to the same fate. When Dreamwave Productions introduced their re-imagined version of Generation 1 continuity for the 21st Century, Bumblebee was present for the Autobots' new adventures once again. The War Within, set in Cybertron's past, chronicled Bumblebee's early adventures in the Battle of Altihex and the defense of Iacon in the face of an attack by Shockwave. When Optimus Prime and Megatron vanish in an early spacebridge experiment, causing the Autobots and Decepticons to splinter into smaller factions, Bumblebee remains with the Autobots under Prowl's command. As usual, Bumblebee is among the Transformers trapped in stasis aboard the crashed Ark who are reactivated on Earth in 1984. Although not depicted in fiction, the general events of the television series pilot seemed to take place in the Dreamwave continuity - with Bumblebee meeting and befriending Spike Witwicky. Classic Bumblebee was featured on the cover of Transformers Club Magazine #14. In a possible future chronicled in the exclusive comic book available at BotCon 2005, Bumblebee featured as the espionage director of the Autobots. Having been on the trail of the Decepticon agent Flamewar for a long time, Bumblebee interrupts a communication between Flamewar and the Tripredacus Council and reveals that his agent, Ricochet, has installed a degenerative virus into Deathsaurus's clone army. With Flamewar now exposed, Bumblebee points out that she was nothing more than a liability to the Council, who blow her ship up. Based on the Transformers Classics toy line, the Timelines 2007 story is set 15 years after the end of the Marvel Comics story (ignoring all events of the Marvel UK and Generation 2 comics). Megatron has survived the crash of the Ark on Earth, reformatted himself into a new form, and now leads Ramjet, Skywarp, Soundwave, Starscream, and the Constructicons. Optimus Prime has also returned to Earth commanding Bumblebee, Cliffjumper, Grimlock, Jetfire, Mirage, and Rodimus (formerly Hot Rod). In Crossing Over, when the Cybertronians Skyfall and Landquake arrive on Earth unexpectedly Megatron attempts to destroy them, but Optimus Prime and his Autobots are able to drive Megatron away. Bumblebee appears in the story Generation 2: Redux in which he is among the reinforcements from Autobot City to respond to the Decepticon attack at the Large Hadron Collider in Switzerland. Once there, the Autobots are able to defeat the Decepticons, but during the fight the Autobots are exposed to refined Forestonite, which enhances and mutates Cybertronian systems. He gets enhanced to his Generation 2 form. Fall of 2005 was the third re-launch for the Transformers comic series, this time under the management of IDW Publishing. IDW's core universe was introduced with the six-issue mini-series, The Transformers: Infiltration, making it clear that the company's take on the Generation 1 universe was radically different. Bumblebee appears as a member of a small team of Autobots under the command of Prowl, operating in secret on Earth out of Ark-19. Still a Volkswagen Beetle, he (like the other Autobots) possesses the added ability to generate a "holo-matter" avatar of a young female to masquerade as a driver and to otherwise interact with humans. Working with Ratchet and a trio of young humans to search an abandoned Decepticon base, Bumblebee is able to take down Skywarp during a Decepticon attack, out-thinking the Decepticon and shooting him out of the sky despite his teleportation system. After Blitzwing and Skywarp bring the base down, Bumblebee helps save the humans, despite commenting previously that they would be acceptable losses. As Megatron then engages the traitorous Starscream in battle, Bumblebee does what he does best by spying on the fight; almost shot by the Battlechargers, he is saved by Prowl and Jazz. In the follow-up, The Transformers: Escalation, he is left to run the Ark-19 on his own. Bumblebee was among the Autobots who opposed the Decepticons serving the elder gods in the IDW Publishing Infestation 2: Transformers comic. Bumblebee, voiced by Dan Gilvezan, appeared in the TFcon 2009 voice actor play Bee for, Bee now. Bumblebee appears among the characters in Re-Unification, the 2010 TFCon voice actor play prelude comic. Bumblebee was one of eight playable characters in the 1986 Commodore 64 video game Transformers: The Battle to Save the Earth. The Classic toy line appeared in a simple Flash-based video game on the Hasbro web site called Transformers Battle Circuit. In this one-on-one fighting game, players press the right and left arrow keys to try to overpower their opponent. Playable characters include Rodimus, Bumblebee, Grimlock, Jetfire, Starscream, Astrotrain, Trypticon, and Menasor. Optimus Prime and Megatron each appear as the boss the player must defeat to win the game. Bumblebee appears in the 2003 video game Transformers, voiced by Jack Merluzzi. Bumblebee is one of the light-blue robots in the 2010 card game Monopoly Deal Transformers. Popular Bumblebee-specific merchandise includes shirts and costumes based on the character. A parody of the Generation 1 Transformers was aired in the December 23, 2008, episode of Frank TV, called "Frank the Halls". In the story, Optimus Prime and his Autobots (Bumblebee, Jazz, and Wheeljack) battle Megatron and his Decepticons (Soundwave and Starscream) when Optimus runs out of gas. Optimus becomes enraged at the price of gas, steals the fuel from the annoying hybrid Autobot Prius Maximus, then joins the Decepticons in destroying the city. Bumblebee appears in the Robot Chicken episode "Junk in the Trunk". In the segment he is in, he is whipped by a towel used by Grimlock in the locker room and later appears at Optimus's bedside before he dies of prostate cancer. Maggie Simpson appeared as Bumblebee in one episode's opening sequence to The Simpsons alongside the rest of the Simpson family rendered as Autobots. Bumblebee is a clone of the original Bumblebee. In "Flash Forward, Part 3", Jhiaxus, seeking to create a new unified faction of Transformers, "borrowed" personality components, forestonite, Hi-Q, and blueprints from Quantum Laboratories. One of these Transformers was a clone of Bumblebee. Bumblebee, along with the other clones, were introduced to Pyro as a second generation of Transformers. In "Flash Forward, Part 5", Bumblebee and Mirage greeted a clone of Sideswipe, unaware the clone was actually the original Sideswipe. In A Flash Forward, Part 6, Bumblebee, Mirage, and Ironhide confronted the escaping Autobots, but Pyro convinced them to return to Earth with him. A redeco of Go-Bot High Beam, transforming into a yellow sports car. He features through-axle construction for incredibly fast zipping on flat, smooth surfaces, and is compatible with many tracks and playsets from Hot Wheels and Matchbox. This figure was later repurposed as the second-generation Bumblebee. This mold was also used to make Robots in Disguise (2001) Crosswise and Nightracer. Bumblebee is the Japanese name of Perceptor in Transformers: Armada. The Mini-Con Sparkplug was also based on the original Bumblebee, while Hot Shot was in fact going to be named Bumblebee but had his name changed due to trademark reasons. A PVC figurine was made for Perceptor/Bumble, part of the tenth act of Super Collection Figures made by Takara. There are two versions: one in cartoon colors and one in a silver color scheme. Bumblebee is a member of Rodimus's crew from Transformers: Energon. He appears only in a flashback and looks exactly like his Generation 1 counterpart. Bumblebee was originally supposed to be one of the main characters of the “Unicron Trilogy” but was replaced by Hot Shot. Led by Rodimus, the crew left Cybertron 8,000 years ago and created a new home world on the planet Omnitron. "Don't worry about the size of the blaster-worry about the sting! ", "The least likely can be the most dangerous. ", "I Sting like a bee!" Bumblebee appears as one of the main Autobot characters in the live-action Transformers film series and the protagonist of his own film Bumblebee. He retains some elements from his Generation 1 design, such as the iconic horn-like pieces in his head, which are articulated in the films. The cautious but brave Bumblebee was given a different alternate mode from his original G1 incarnation; instead of a Volkswagen Beetle, he transforms into a rally yellow Chevrolet Camaro (the model year of which is upgraded in the first film). Director Michael Bay states in the special features of disc two of the first film's DVD release, that the change of Bumblebee's alternate mode was due to the fact that a Volkswagen Beetle reminded him of Herbie. Due to a battle injury, he is rendered effectively mute, and communicates through use of selected playback of radio and television signals. Though his original voice is restored at the end of the first Transformers film, he communicates solely through his radio in Revenge of the Fallen, Dark of the Moon and Age of Extinction. The biography for the Decepticon Hardtop figure states that he and Bumblebee are old rivals and it was not Megatron who damaged Bumblebee's vocal processor, but a shot from Hardtop's gun. This is in almost direct opposition of the film's prequel. Bay stated in an early interview that Bumblebee stands about 17.5 feet tall (5.33 m), but the official guide to the Transformers video game says he is 16 feet tall (4.88 m). Bumblebee depicted as a 1976 Camaro and three different iterations of a fifth-generation Camaro and below as a modified 2011 Camaro SS. The vehicles used for Bumblebee, Ironhide, Jazz and Ratchet were put on display by General Motors at the 2007 Detroit River Walk Festival a little over a week before the U.S. release of the film. In Hot Rod magazine's Nov. 2006 issue, Bumblebee was a feature article. Originally a worn-out 1969 Camaro, producers settled on a 1977 model. It is painted yellow with black stripes, primer and rust patches, riveted hood scoop, Cragar SS wheels up front, Eric Vaughn Real Wheels in the back, marine-grade vinyl seats, and even an eight-track player. The Camaro Concept model was built using a 2005 Holden Monaro by Saleen, with the body built from the same GM R&D molds that were used in the original 2006 Camaro Concept (the Monaro and Camaro share the same Zeta platform). Bumblebee is armed with a plasma cannon that is capable of selective fire. The 1977 Camaro movie vehicle was sold on eBay with a winning bid of U.S. $40,100.01. As a tribute to the original form of Bumblebee, a yellow Volkswagen Beetle appears next to him at the car dealership. Bumblebee damages the Beetle in order to ensure that Sam purchases him. He also has a bee-shaped air freshener attached to his rear-view mirror with the words "Bee-otch". The air freshener was the subject of a lawsuit for $850,000 due to its alleged resemblance to another design. Since his conversion from 1977 Camaro to 2006 Camaro Concept, Bumblebee's alternate mode continues to evolve throughout the film series. In Revenge of the Fallen, he sports a different set of alloy wheels (apparently, in the first two films are actually hubcaps made from composite to look like a set of wheel-disc brake) and a custom front bumper. For Transformers: Dark of the Moon (now a Camaro SS), his color changes from yellow to amber with thicker black stripes that run across his hood, roof and trunk. In addition, he will have dark-colored rims and side mirrors, as well as a rear spoiler. Also, in Transformers Dark of the Moon, he has a stealth force battle mode in which he can use his weapons in car mode without fully transforming and still being able to seat a driver and passengers. Sometimes he is also known as N.B.E.-02 and B-127. Entertainment Weekly named Bumblebee as their seventh-favorite computer-generated character. In Transformers: Defiance #1, back on ancient Cybertron, Bumblebee, and Cliffjumper are tasked to watch over the AllSpark at the temple at Simfur. In issue #3, Megatron learns that Optimus has broken into his room and sends Bumblebee, Camshaft, Cliffjumper, Jazz, Prowl, and Smokescreen to arrest Optimus Prime for treason. Optimus demands to speak directly to Megatron, but while en route to Megatron's location, they are ambushed by Barricade, Brawl, Crankcase, Frenzy, Starscream, Skywarp, and Thundercracker, under orders to kill them all. Smokescreen is able to cover Optimus and his group's retreat in the confusion of an explosion. In issue #4, Arcee, Bumblebee, Cliffjumper, Jazz, and Smokescreen ambush Ironhide, who they believed works for Megatron, but Ironhide instead joins Optimus Prime's Autobots. Arcee and Bumblebee later spy on the building of the Decepticon starship Nemesis. The Transformers: Movie Prequel reveals that in the battle of Tyger Pax, Megatron's forces attack, searching for the All Spark. Bumblebee's squad (which includes Arcee) attempts to hold off the Decepticons, but are eventually overwhelmed. They are captured and tortured by Swindle, with Megatron intervening personally to torture Bumblebee for information. However, they refuse to speak long enough for Prime's secret plan to take effect—launching the AllSpark into outer space. Megatron attempts to pursue it, but Bumblebee stops him. An enraged Megatron rips Bumblebee's arms off and crushes his voice capacitor, promising to seize the AllSpark for himself eventually. Bumblebee recovers and is repaired, although his voice is damaged beyond repair. Bumblebee then volunteers to head into space to stop Megatron from acquiring the All Spark. Eventually arriving on Mars in his protoform mode, Bumblebee then proceeds to Earth in 2003, his arrival tracked by the Hubble Space Telescope. Upon landing in New York City, Bumblebee assumes the form of a beat-up Chevrolet Camaro, all the while avoiding the agents of the government organization known as Sector 7, who refer to him as NBE-2 (or Non-Biological Extraterrestrial 2). Bumblebee then downloads information on Captain Archibald Witwicky. Arriving at the asylum where he had once been incarcerated, he finds it now a dilapidated ruin. Damaged by a pursuing Barricade, he then finds AllSpark-like emissions somewhere in New Mexico—unaware it is a trap set by Sector 7. However, their plan to capture him is thwarted when Starscream, Barricade and Blackout arrive. As the Decepticons shoot Sector 7's trap to pieces, Bumblebee escapes—unaware the Decepticons had let him go so that they could follow him and see what he knew about the All Spark. He is last seen in the series heading for Tranquility, Nevada—home of Captain Witwicky's descendant Sam. In the comic adaptation of the film, Bumblebee downloads information on the internet about the Concept Camaro car and took on its form instead of driving past in a tunnel, as seen in the film. He also appears in the official movie sequel comic called The Reign of Starscream. In Transformers: Alliance, the Autobots aid the human soldiers after the battle in Mission City, destroying the All Spark-powered machines that were created. After Ratchet finishes repairing Bumblebee's legs, a trailer is obtained for Optimus Prime to carry the remains of Jazz. The Autobots then leave Mission City before the Sector 7 personnel arrive to claim the remains of the Decepticons. About a month later, Epps and Lennox contact Optimus Prime, Ratchet and Ironhide about aiding them in escorting the remains of the Decepticons to the naval yard. Unknowingly they are spied on by Barricade, who transmits the information to Starscream. Bumblebee appears in Transformers: Tales of the Fallen #1, where Barricade kidnaps Sam in order to flush out Bumblebee and learn where the AllSpark fragment is. Bumblebee saves Sam and fights Barricade, who escapes in the process. Bumblebee appears in Transformers: Nefarious #1, set months after the events of the 2009 film. Bumblebee, Breakaway, Jolt, Knock Out and Dune Runner are sent to investigate spark fragments detected at Kingdom Petrochemicals. Arriving first, Breakaway is warned by Soundwave to leave, but unwilling to give in, the Autobot is swiftly defeated. Bumblebee and his team fire on Soundwave, who escapes. The drone calling itself Brains runs into Bumblebee and Sam Witwicky in Philadelphia. In "Twilight's Last Gleaming Part 3", Bumblebee attempts to take on Megatron in the Sector 7 base. Meanwhile, Mikaela attempts to free Optimus Prime, but she is attacked by Frenzy. Bumblebee appears in issue #17 of the Titan Transformers Magazine, in a story called "Return to Cybertron Part 1". In this story, he is among the Autobots that go to Cybertron. Bumblebee returns in issue #22 of the Titan Transformers Magazine series in a story called "The Decepticon who Haunted Himself." Bumblebee also appears in the prequel novel Transformers: Ghosts of Yesterday. Here, it is revealed he could still communicate with the other Autobots via digital link. Bumblebee is part of Prime's Autobot team searching for the All Spark, and is described as one of the Autobots' best scouts. He is sent after the human vessel Ghost-1 (reverse-engineered from studies of Megatron) to make contact, but is ambushed and forced underground by Starscream. Encountering giant rock-chewing worms, he is saved by Optimus Prime. Heading into the atmosphere once again, he and Ratchet took on Barricade, but are unable to stop Starscream from destroying the human vessel. According to his extended biography from the Target store-exclusive Robo-Vision web site, Hardtop came to Earth and discovered the Witwicky home before any of the other Decepticons, but was unable to attack the Witwickys because Bumblebee found him first and buried him under a hundred tons of rubble in the Rocky Mountains. Bumblebee appears in the 2007 live-action Transformers movie, returning to his role as the friend of the Autobots' human ally – in this case, Sam Witwicky. Sam possesses the glasses of his great-great-grandfather Captain Archibald Witwicky, a famous explorer. Unknown to Sam, the glasses are engraved with the coordinates showing the location of the life-giving All Spark. Bumblebee is assigned to guard Sam from the Decepticons, and poses as a dilapidated 1977 Chevrolet Camaro as Sam and his father are buying a car for him. They eventually purchase Bumblebee, due in no small part to Bumblebee damaging every other car at the dealership to ensure his purchase. Later, Bumblebee drives away from Sam's home to summon the Autobots. Sam thinks Bumblebee is being stolen, and chases the car on his bike. Sam then witnesses Bumblebee transforming into robot mode and reports it to the police, who believe he is on drugs. Bumblebee returns to Sam house to come get him but he ran away from him which resulted a chase through town. After Sam gets attack by Barricade, Bumblebee came to his and his crush Mikaela Banes, who followed Sam, rescue as was able to get them away. Bumblebee battle Barricade while Sam and Mikaela battle Frenzy where they both ended up being victorious, although they weren't killed just defeated them for a while. Bumblebee was able to earn Sam's trust when he understood that he's doesn’t want to hurt them. When Mikaela criticizes the poor condition of Bumblebee's vehicle mode, he scans a passing Camaro Concept and transforms into the same model. Bumblebee then drives Sam and Mikaela to an alley where they meet the other Autobots as they properly introduced Bumblebee, due to his voice being damage in battle, to Sam and tells him that he is his guardian also they explain why he talks through the radio. They return to Sam's house and retrieve the glasses, but a secret government organization, Sector 7, arrests Sam and Mikaela. The Autobots attempt to rescue them but Bumblebee is captured and taken by Sector 7. There he is tested and tortured by the Sector 7 scientists using electric shocks that appear to hurt him. Sam eventually negotiates his release. Bumblebee survives the massive battle at the film's climax, although he loses the use of his legs after helping Ironhide deflect missiles from Starscream. With Mikaela's aid, he is able to rejoin the battle supported by a tow truck (later confirmed to be the Autobot Longarm), and destroys Brawl. After the battle, Bumblebee is fully repaired and asks to stay with Sam and is granted permission from both Sam and Optimus Prime. He is later seen alongside Ironhide, Ratchet, and Optimus watching the sunset while Sam and Mikaela recline on his hood at the end of the movie. Bumblebee is voiced by Mark Ryan in the films, but he mostly speaks with his radio, having had his voice processor damaged (though his actual voice squeaks and whines laboriously through much of the movie). He also speaks with quotes from television shows and movies, in a way similar to Wreck-Gar from the 1986 film and season three of the G1 cartoon series. Screenwriter Roberto Orci explained Bumblebee regained his voice through the regenerative laser Ratchet fires at his neck as they meet, and it eventually works its magic by the end of the film. He agreed this was not made clear. Frenzy is regenerated upon coming into contact with the All Spark, and so it is entirely plausible that Bumblebee's voice, along with his legs, is also healed by the AllSpark, though no mention of this is made in the film. It was said that making Bumblebee mute was to show that his bond with Sam went beyond words. Bumblebee also appears in the film's sequel, Transformers: Revenge of the Fallen. When a fragment of the AllSpark inadvertently turns the kitchen appliances in Sam's home into feral robots, Bumblebee intervenes to save him and his family. In doing so, he nearly destroys their house. He still uses his radio to speak, despite his vocal processors being repaired in the first film. However, he does respond half-way when Sam tells him to get in the garage by saying "whatever." Bumblebee shows excitement at the thought of going with Sam to college, only to be disappointed later when Sam tells him that he can not come. Because of the incident at the Witwickys' he is also forced to leave their garage. Soon after Sam begins his semester at college, Bumblebee follows him and tries to alert him to the Decepticon Pretender (named Alice) that is following Sam. As both Sam and Alice are riding inside Bumblebee, the Autobot attempts to warn Sam through his radio. Having failed at this, Bumblebee intentionally brakes hard multiple times and throws Alice around the interior in an attempt to damage the Pretender. Bumblebee then proceeds to spray lubricant over Alice, thereby embarrassing Sam and forcing Alice to flee. Soon after Megatron and Scalpel begin to torture Sam, Bumblebee arrives alongside Optimus Prime to fight Megatron, Starscream and Grindor. After Optimus dies, Bumblebee arrives with Sideswipe, Ironhide and Ratchet to cover Sam's escape. As they mourn for Optimus, Sam tells Bumblebee that he has failed the Autobots, but Bumblebee tells Sam through his radio, ... "You are the person I care for most in my life, and if there is anything you need I won't be far away..." After taking Sam, Mikaela, Leo and Simmons to the Smithsonian museum to reawaken Jetfire, Bumblebee then travels with the humans through a Space Bridge to Egypt (caused by Jetfire) along with Jetfire, the Twins Skids and Mudflap, and Wheelie to find the Matrix of Leadership. While the twins have a sibling argument (resulting in a fist fight) inside the ruins of Petra (which supposedly houses the Matrix when everyone thinks it is a dead end), Bumblebee breaks them up and tosses them out before seeing their fight. But once seeing the Tomb's entrance after the Twins' brawl reveals it, Bumblebee helps the humans enter it by blasting the rest of the wall off. During the final confrontational battle, Sam and Mikaela inadvertently spring a trap set by Rampage (who uses Sam's parents as the bait). Bumblebee stays hidden from Rampage's sight, allowing Sam to put Rampage in a spot where Bumblebee can initiate a surprise attack. During the subsequent fight Ravage attacks him from behind and jumps on his back. After a brief struggle, Bumblebee gets a hold of Ravage and literally tears him apart with his hands, allowing him to finish off and kill Rampage. With Sam's parents free, Sam tells Bumblebee to take care of them, thus removing him from most of the final fight. After Sam is killed by Megatron, Bumblebee arrives with Sam's parents and sees Sam's body on the ground, he is heartbroken, overcome with sadness and stricken with sorrow, believing that he has failed in his duty to protect Sam, but is overjoyed to see him return. Bumblebee is among the remaining Autobots at the end of the film. In Transformers: Dark of the Moon, Bumblebee no longer lives with Sam and goes on other missions with the Autobots such as dismantling an illegal nuclear facility in the Middle East. This is the first time the stealth force upgrade is shown in the movie. When Sam arrives with Carly, Wheelie and Brains, Bumblebee saves them from the soldiers taking them captive. Bumblebee is reassigned to protect Sam and moves back in with him. Bumblebee later teams up with Sideswipe and Dino/Mirage to take out Hatchet. While Dino/Mirage clings on to hatchet with his grapplers, Bumblebee and Sideswipe shoot their stealth force weapons. While trying to protect Sentinel Prime, Bumblebee and the other Autobots are betrayed and attacked by him. Sentinel brutally kills Ironhide, but Bumblebee manages to escape. After Sentinel forces the Autobots' exile from Earth, Bumblebee sadly says goodbye to Sam, but reunites with him in Chicago where he helps him rescue Carly and kill Laserbeak. After Sam kills Starscream, Bumblebee saves him and Lennox from a great fall. Bumblebee is captured by Soundwave and is nearly executed in front of Sam (telling Sam "We gave them a hell of a run") after Barricade executes Que before Wheelie and Brains save him at the cost of their own lives, allowing him to break free and attack Soundwave. Bumblebee battles Soundwave while the other Autobots fight the other Decepticons and proves more than a match for the Decepticon spy-master, even managing to kill another Decepticon during the fight. Finally Bumblebee knocks Soundwave off-balance with a shot to the leg, knocks his sonic cannon from his hand and uppercuts his plasma cannon into his chest, firing at the same time, destroying Soundwave's head and killing him. Bumblebee fights Sentinel alongside the other Autobots and humans; he is no match for him, but avoids injury. After Sam kills Dylan Gould, Bumblebee destroys the Control Pillar by crashing through it, shutting off the Space Bridge and destroying Cybertron and the remaining Decepticons. Bumblebee survives the battle and gives Sam a bunch of gaskets to use as rings while playing wedding music after Sam and Carly admit they love each other. Though Sam says to Bumblebee that he's thinking too fast. He replies by 'saying', "I'm just trying to help out." Ratchet compliments Bumblebee for his bravery. Bumblebee returns in Transformers: Age of Extinction. He has a new vehicle mode, a modified 1967 Chevrolet Camaro, before he scans a yellow 2014 Camaro and turns into a 2014 Chevrolet Camaro concept, because of this his robot mode has been changed as well and resembles one design of Bumblebee from the Generation 1 IDW comics. In the end of Age of Extinction, Bumblebee assumed the Autobot leadership and protecting the Yeager family as Optimus blasts off to space along with the Seed, finding the mysterious Creators. Though Bumblebee mostly can't speak in the film and still relies on radio communication, he is shown to be able to express limited speech but in a more high-pitched voice, possibly meaning his voice box is healing. Bumblebee returns in Transformers: The Last Knight, as the last appearance of this incarnation. In the former, he now displays the ability to separate and reassemble himself during combat, as shown when he battles the TRF soldiers in order to protect Cade. He is also revealed to have helped the United States Army Air Force to fight the Nazi Party during World War II, and transformed into a Mercedes-Benz 770. He also regained his voice during his battle with Optimus Prime. After Optimus Prime regains control of himself, Bumblebee and the rest of the newly allied Knights meet up with the rest of the Autobots. During the final battle, Bumblebee is shown with Hot Rod flying in a ship and is attacking Megatron and his forces. At one point, Bumblebee shoots at Infernocus, a Decepticon combiner, and is shot down. Bumblebee then leads Hound and Optimus against Megatron and Nitro Zeus. After they go weightless, Bumblebee shoots Nitro Zeus in the back of the head. Finally, Bumblebee sneaks up behind Quintessa and shoots her, supposedly killing her. Bumblebee is last seen getting ready to leave Earth to restore Cybertron with the Autobots. Bumblebee is finally given primary focus in the 2018 reboot film Bumblebee, where he is the titular protagonist (albeit he is designated as B-127 for the first part of the film). Taking place in an apparent new continuity from the other five films, he first appears on Cybertron along with other Autobots, including Optimus Prime. As the Decepticon battalion overwhelms them, Optimus Prime forces a retreat and tasks B-127 with traveling to Earth and establish a base for them. Upon crash-landing on Earth in a forest, he is intercepted by Sector Seven forces, led by US Army Ranger Jack Burns, scanning a Military jeep in an attempt to escape. As he attempts to flee from them, he is ambushed by the Decepticon Seeker Blitzwing. When B-127 is subdued, Blitzwing demands the location of his fellow comrades, but he pledges to "never talk", prompting the Seeker to rip out his voice synthesizer. Despite this, before Blitzwing can execute him, the Scout jams one of the Decepticon's own missles into his chest before blasting it, killing Blitzwing in the detonation. With his memory cells severely damaged, B-127 scans a nearby Volkswagen Beetle before entering stasis. Brought back in vehicle mode to a junkyard, he is eventually found in a boatyard by a teenage girl named Charlie Watson, who unwittingly activates a homing signal that reaches 3 Transformers on a moon of Saturn: Decepticons Shatter and Dropkick as well as the Autobot Cliffjumper. The 2 Decepticons decide to come to Earth to hunt for B-127 instead before killing Cliffjumper. Charlie is able to get the Beetle working after some time and she drives the car home after her uncle gives it to her as a birthday gift. Back in her garage, she is attempting to fix the Beetle when a part falls out from its undercarriage, B-127 abruptly transforms after Charlie shines her light on his mechanical face. After discovering he is as afraid of the girl as she is of him, she compassionately converses with the Autobot, naming him "Bumblebee" after hearing the warbled buzzes and beeping noises he makes. The following day, Bumblebee is taught by Charlie to maintain his cover in a secluded beach, who tells him he should always assume vehicle mode unless they're alone. Bumblebee is also later discovered by Memo, a boy who has a crush on Charlie and is sworn to secrecy by her. After going on a few humorous adventures with the humans, Bumblebee is eventually discovered and captured by Sector Seven, along with Shatter and Dropkick. He is later brought to an air base where he is tortured by Shatter and Dropkick about the Autobots. They activate a holographic message in the scout of Optimus Prime intending to retreat to Earth with the other Autobots. Shatter and Dropkick resolve to in turn send a message to the Decepticons on Cybertron to invade Earth before they leave a critically injured Bumblebee for dead. He is then revived by Charlie who uses Sector Seven's high voltage guns to do so, restoring his memories. After escaping Jack Burns and his unit's attempts to hold him back, Bumblebee resolves to set out to stop the Decepticons. Upon reaching the tower where Shatter and Dropkick are, he makes Charlie hide before engaging in a fierce battle with Dropkick in a dry dam area. After a rather lengthy battle, Bumblebee uses a chain entangle Dropkick before yanking it to shred him apart, destroying him, while Charlie makes her way to the tower by climbing a nearby crane. When Jack Burns and his men arrive to try and stop Shatter as well, she shoots down their helicopter, but Bumblebee is able to catch it in time before it can crash, saving Burns' life. Charlie manages to deactivate the Cybertronian homing beacon on the tower, causing an enraged Shatter to pursue her. However, Bumblebee stops her from doing so, but is himself pinned down by the Decepticon. He blasts a nearby dam wall, causing it to give way and flood the dam. Bumblebee sinks into the waves while Shatter is crushed against a ship, destroying her as well. Charlie dives in to save Bumblebee and the pair eventually reach the surface. Afterwards, Charlie and Bumblebee head to the Golden Gate Bridge where she tearfully bids goodbye to him as she knows the scout has a greater purpose on Earth. Before driving off, Bumblebee scans and transforms into a 1977 Camaro that resembles the Camaro seen in the 2007 film. He then rendezvouses with a Red Freightliner truck on the bridge, revealed to be Optimus Prime in disguise. Meeting properly in a forest, Prime congratulates Bumblebee, assuring him that the Autobots have a future thanks to his efforts. The scout asserts his new name while witnessing more Autobots arriving on Earth. In Cyber Missions 1, Bumblebee and Ironhide are protecting NEST Command when two Decepticons, Soundwave and Bludgeon invade the area. Ironhide goes outside to deal with Bludgeon, while Soundwave ambushes Bumblebee from inside. Bumblebee is easily thrown down by Soundwave. Bumblebee tries to fire a shot from his shoulder gun, but Soundwave redirects the acoustic energy back at him. Bumblebee deduces that he cannot deflect several rounds at once, and begins rapidly firing at Soundwave. The Decepticon is not able to take in so much, and finally falls. Later, Bumblebee traps Soundwave in a magnetically sealed bubble in Cyber Missions 2. Bumblebee is a playable character, and is the most-used character in the Autobot campaign, where the character uses Bumblebee in nine missions in the Autobot campaign, out of the total 18. He is playable in both the old and new Camaro cars. Bumblebee also appears as a boss in the Decepticon campaign, with a radial blast attack. Bumblebee is among the playable characters in the 2009 Revenge of the Fallen video game by Activision. The film version of Bumblebee is playable in Hasbro's Net Jet Transformers fighting game Transformers Battle Universe. Although other playable Transformers in the game have several incarnations featured, no other versions of Bumblebee are playable. Bumblebee is among the characters who appear in the TRANSFORMERS CYBERVERSE Battle Builder Game. Bumblebee is one of the Autobots featured in Transformers: The Ride at Universal Studios theme parks. In the ride, Bumblebee disembodies Ravage while Evac escapes from the Decepticon attack on N.E.S.T. headquarters. Towards the end of the ride, Bumblebee saves Evac from falling off a building after Evac kills Megatron with the AllSpark shard. Bumblebee appears in the episode of Robot Chicken called "Tell My Mom", voiced by Seth Green. Sam Witwicky finds Bumblebee in Bobby Bolivia's used car lot and they go on an adventure, while Scooter is the only thing cheap in the lot. Bumblebee is portrayed as a fifth-generation Camaro. During the final battle of the 2017 Power Rangers film, the Red Ranger, while piloting his T-Rex Zord, accidentally steps on a yellow Camaro of a similar model as the live-action Bumblebee. He throws the car at an army of Putties and shouts, "Sorry, Bumblebee!" as the car makes impact. "Enough talk. It's time for action!" Bumblebee appears in the Transformers Animated series in 2008 as a yellow hot hatch undercover police car (scanned from a vehicle driven by Detroit Police Captain Fanzone). The character of Bumblebee in Animated is described as a hot headed racing young Autobot who likes video games, making him more akin to Armada Hot Shot than the original Bumblebee. He does however retain the traditional warm-heartedness and human-friendly attitude of the original due to his friendship with Sari Sumdac and Bulkhead. Although considered childish and self-centered by many of his fellow Autobots, Bumblebee shows a loyal and caring side for his friends, and can be considered protective of Sari Sumdac, to the extent of blocking shots, blasts, and missiles from harming her. This was first shown in "Transform and Roll Out! Part 3" when he deflected a shot from Starscream that was aimed at Sari. The blast rendered him unconscious until Sari healed him with her Key. He is the kid-friendly character of the show. Bumblebee has a retractable face plate he uses when he goes into combat and a retractable weapon (called "energy stingers") in both hands. He can use the wheels on his feet in robot mode as motorized roller blades. In the Japanese translation of Transformers Animated, the story has been changed to make it a prequel to the 2007 Transformers live-action film. This makes this version of Bumblebee an earlier version of the film character. In the episode "Autoboot Camp", Bumblebee has flashbacks to his days as an Autobot trainee. During training, he met Bulkhead, Longarm, Ironhide, and Wasp. The group was under the command of Drill Sergeant Sentinel Minor, who gave Bumblebee his name (after calling him a "bumbler"). Bumblebee would often say or do the wrong thing, resulting in the entire platoon receiving Transformation push-ups as a result, which made him unpopular with Wasp and Ironhide. One day, Bumblebee heard someone communicating with Megatron. Believing the traitor to be Wasp, Bumblebee (with help from Longarm) discovered evidence in Wasp's locker. For discovering the traitor, Sentinel was prepared to give Bumblebee Elite Guard membership. However, Bumblebee gave up that chance by taking the rap for Bulkhead, who had previously knocked a building onto Sentinel, and was about to be removed from training, joining his new friend as a Space Bridge technician. Bulkhead and Bumblebee were assigned to a Space Bridge repair ship under the command of Optimus Prime, along with Ratchet. Both he and Bulkhead were the first to encounter Prowl before he joins their group. In the series finale, during a rescue mission to save Arcee, who was on the moon, Bumblebee manages to settle the score with Shockwave before he and Bulkhead put him under arrest. After the Autobots learn of Prowl's ultimate sacrifice, they take the sparkless body of Prowl and the captured Megatron, Lugnut, and Shockwave to Cybertron. On their arrival home, they are greeted and cheered on by the other Autobots for their victory over the evil and malevolent leader of the Decepticons. Bumblebee appeared in the 2008 BotCon voice actor play Bee in the City, voiced by Bumper Robinson. In this story Professor Sumdac attempted to create a teleportation system to get the Autobots to Cybertron, but an interaction with Sari's key ended up transporting Optimus Prime, Bumblebee and Sari to Transtech Cybertron, where they met Flareup and his friends were detained by Shockwave while he was deemed not a threat. Bumblebee teamed up with transformer named "Joe" to help him and Flareup get their friends. But after Joe exposed himself as a Megatron and uses Sari's key to create an army to begin a reign of terror, Bumblebee pointed out the world's bureaucratic nature that resulted in a mutiny. Afterwards the Autobots and Sari returned to their own dimension. Set shortly after the events of "Total Meltdown" is the Transformers: Animated comic issue #2 by IDW Publishing. In it, Bumblebee and Prowl apprehend the Angry Archer as the villain attempts to steal money from a used car salesman. In doing so, they reveal the holographic trickery of the Detroit superhero known as The Wraith. With the secret of his power revealed, The Wraith loses much of the respect he used to command in Detroit. The Wraith attempts to stop Cyrus "The Colossus" Rhodes from escaping prison, but is unable to fool the villain now that the secret is public, forcing the Autobots to stop Rhodes and making The Wraith look foolish. The Wraith then attempts to discredit Bumblebee at a college football game by trapping the Autobot with a car boot and using his holograms to make a fake Bumblebee attack the stadium. Bumblebee eventually escapes and the other Autobots help capture The Wraith before having him placed in a mental institution. Bumblebee is one of the five playable characters in the 2008 Transformers Animated video game for the Nintendo DS. In the Transformers: Timelines series, Goldbug is an evil alternate reality version of Bumblebee. According to his official biography, Goldbug was once a young drifter known as Bumblebee. He survived on the streets of Polyhex with no real purpose. He became skilled at sneaking around, stealing, eavesdropping and blackmailing. He eagerly joined the Autobots in hopes of finding a place to belong and where his unsavory activities would be tolerated. When the war began, Bumblebee showed extreme bravery in battle and often sought ways to be noticed by command. In time, he worked his way up the ranks of the Autobots and when the Autobot Seeker Drench was destroyed, Bumblebee was offered an upgraded form and a new identity as Goldbug, to take his place. Goldbug is paranoid that one of his fellow Autobots will betray him and try to take his place, as he did to his former superiors. The Botcon 2008 set was chosen as the "Action Figure Digest Hot Pick." Goldbug appears in the 2008 April Fool's comic Shattered Expectations by Fun Publications. Goldbug appears as a member of Optimus Prime's forces in the Transformers: Timelines story "Shattered Glass." Goldbug and Blurr report to Optimus Prime the rumors that Megatron is planning an attack. When the Decepticons attack the Ark launch site Blurr, Goldbug and Rodimus compete for who could destroy the most Decepticons, but thanks to Cliffjumper the Decepticon attack is successful. Goldbug appears in the fiction Dungeons & Dinobots, a text-based story. He is among the Autobots who attack the Decepticons at the Arch-Ayr fuel dump. He is later sent to capture rogue Dinobots for the Autobots. He is part of the group that captures Swoop. In Do Over Goldbug conspires with Rodimus to take over the Autobots. Together they steal the Ark, evicting any crew members who are loyal to Optimus Prime before blasting off to Earth. The Ark then crashes on Earth. Goldbug is among the Autobots brought back online. He initially commands a small group of Autobots who find Rodimus. After losing a fight with Rodimus for leadership Goldbug participates in the attack on Burpleson Air Force Base. The Chrysler ME 412 concept car. Goldbug is a remold of Cybertron Hot Shot. He is redecoed yellow-and-black, and has a blue head remolded to look like the Generation 1 Goldbug toy. This toy is 14 centimetres (5.5 inches) long, while a real Chrysler ME 412 is 454 centimetres long (14.9 ft). This gives the toy a scale of 1:32. The robot mode would stand about 14 feet 11 inches (4.55 m). Team Prime, Rescue Bots (briefly), Stealth Team. Raf Esquivel, Bulkhead, Arcee, Jack Darby, Miko Nakadai, Cody Burns, Blades, Optimus Prime, Ratchet, Smokescreen, Cliffjumper, Ironhide, Sideswipe, Jetfire, Silverbolt, Air Raid, Warpath, Strongarm, Drift, Fixit, Windblade and Grimlock. "Actions speak louder than words." "The least likely can be the most dangerous." Bumblebee is one of the main group of Autobots in the 2010 computer-animated series Transformers: Prime. Bumblebee is younger than most of the Autobots, and lost his voice box thanks to Megatron during the Great War. Bumblebee remains more playful than the other Autobots despite his lack of voice, and has come to rely on his speed as his most valuable asset in battle. Bumblebee is extremely similar to his movie counterpart, sharing the similar vehicle and robot forms, the same lack of voice, and his close relationship to a human boy. It is also revealed in the series finale episode "Deadlock" that Bumblebee's mouth was covered by a face plate vaguely resembling that of Optimus Prime's that helped him to create the alternative beeping noises he uses as his main form of communication throughout the series. Later in the series he changes his color scheme by reversing the colors, resembling Bumblebee's original 1976 paint scheme in the 2014 Age of Extinction film. Bumblebee returns as the central protagonist of the sequel series Transformers: Robots in Disguise, with Will Friedle reprising his role. Set five years after the events of Prime, Bumblebee becomes the leader of a group of Autobots and they return to Earth to fight a new generation of Decepticons, when the re-emerge on the planet after a prison ship crash. A constant running gag throughout the first season is Bumblebee's inability to come up with a decent command for his team to mobilize, in the vein of Optimus Prime's famous order to "roll out". Bumblebee retains a similar vehicle mode as he did in Prime, now a 1992 Chevrolet Camaro (And in the films Bumblebee is a Camaro) however, his robot mode has gone through a serious redesign. Notably retaking his original primarily yellow color scheme rather than the dominantly black one he took at the end of Prime. Bumblebee appears in the novels Transformers: Exodus and Transformers: Exiles. Bumblebee losing his voice was the focus of the short story "Bumblebee at Tyger Pax" By Alex Irvine. Bumblebee appears as a playable character in the 2010 video game Transformers: War for Cybertron. In the Autobot campaign, he is first seen racing across the war-torn streets of Iacon in search of Optimus. Upon rendezvousing with Optimus, he relays the message of Zeta Prime's death at the hands of Megatron; after which, he joins Optimus and Ratchet in their resistance against the Decepticons on the planet. He later appears in the final level of the game, where Bumblebee teams up with Optimus and Ironhide to prevent the Decepticon Titan, Trypticon from destroying Iacon. In Transformers: Fall of Cybertron, the sequel to War for Cybertron, players start as Bumblebee in the first level. He appears throughout the game as well. With the exception of Optimus Prime, Bumblebee is the only character to appear in all three TV shows set within the Aligned Continuity, including Transformers: Rescue Bots and Transformers: Robots in Disguise. Frank Welker recorded actual words written for Bumblebee which were later replaced with sound effects. When Bumblebee regains his voice, it's provided by actor, Will Friedle. Bumblebee appears in the pilot episode of the series responding too late to a call for help from Cliffjumper, who is captured by the Decepticons and killed. Bumblebee soon is assigned to be Raf Esquivel's guardian, having grown close to the boy as he understands his language of beeps. In the "Operation: Bumblebee" two-parter, Bumblebee lost his transformation cog and its ability to have him transform before eventually retrieving the cog from human terrorist group M.E.C.H. and Starscream. Bumblebee's goal in the series is to be promoted to warrior class, as he first states in "Masters & Students". Optimus does not believe him to be worthy of promotion at such a young age. Nevertheless, Bumblebee shows he is still a capable warrior, since he is able to fight the likes of Breakdown and Shockwave. When questioned by Smokescreen in "Project Predacon", Bumblebee admits he is holding back so that he can one day be promoted to warrior class on Cybertron. In "Deadlock", during the final battle aboard the Nemesis, Bumblebee tries to give Optimus Prime the Star Saber for him to fight Megatron, but is killed by the Decepticon. However, Bumblebee fell into the ship's Omega Lock and exposure to the Synthetic Energon powering it both revived him and restored his voice. As Megatron prepared to finish Optimus, Bumblebee used the Star Saber to stab him in his spark, killing him. Afterwards, once the Omega Lock restored Cybertron, Bumblebee gives Raf a goodbye before leaving for his home world where he is finally promoted to warrior class during the series finale Predacons Rising. However, things quickly turn for the worse when Unicron appears on Cybertron in Megatron's body, and two new Predacons are cloned by Shockwave. With Optimus on a mission to retrieve the AllSpark, and Ultra Magnus having been severely wounded by the new Predacons, Bumblebee becomes Autobot leader at Ratchet's encouragement as he leads them, the newly defected Knock Out and the three Predacons in making a stand against Unicron's undead Predacon army at the Well of All Sparks, buying enough time for Optimus to return to defeat Unicron. Optimus reveals that he must sacrifice himself to restore the AllSpark to Cybertron's core, and does not pass on leadership to any one person present, stating that leadership will now be earned through actions. Bumblebee promises to keep the peace on Cybertron to Optimus, implying Bumblebee to be the new leader of the Autobots, and by extension, Cybertron's new age. Bumblebee has always been an amazing character and kids love Bumblebee, but to actually have him to be able to express his thoughts, express how he's feeling and express his doubt as he's leading this new team I think is one of the key things that really brought Robots in Disguise together. Bumblebee appears as the main protagonist of the sequel series Transformers: Robots in Disguise, with Will Friedle reprising his role. In the series, Bumblebee is called to Earth when a new generation of Decepticons re-emerges on the planet. After receiving a vision from Optimus Prime, Bumblebee travels to Earth via a spacebridge and discovers that a ship full of Decepticon criminals has crashed on Earth and its inmates have escaped. Initially believing that Optimus' mission is intended for him alone, Bumblebee ends up with a team of ragtag Autobots, including a rebel bad boy bot named Sideswipe, a hyper active Mini-Con named Fixit, the bombastic ex-Decepticon and Dinobot Grimlock, and an Elite Guard female cadet named Strongarm, in order to combat the Decepticons. After befriending humans Denny and his son Russell and fighting the Chompazoid Underbite, the group is greeted by the inexplicably corporeal Optimus. Unable to explain his return, Optimus expresses his confidence in Bumblebee and his new team before departing. While leading the team, to recapture the escaped Decipticons, they come across Steeljaw, an escaped convict who has his own plan to lead the other escaped convicts. The Autobots would later receive a visit from Bumblebee's old comrade Jazz, who informed Bumblebee that his actions in departing Cybertron had angered the high council. After helping apprehend a fugitive named Ped, Jazz volunteered to return to Cybertron and inform the council of what had taken place. The team then received another group of Cybertronian visitors, in the form of Autobot bounty hunter Drift, Decepticon bounty hunter Fracture, and their Mini-Con teammates. Both Cybertronians arrived to collect a bounty placed on Bumblebee by the High Council for his actions, but Drift was convinced of Bumblebee's nobility after Bee saved his life. The team managed to defeat Fracture, and though his ship was lost they gained the use of his ground bridge. After all of them but Grimlock and Fixit were given Decepticon Hunters, Bee and his team would then be forced to deal with Steeljaw's gang again—now including Thunderhoof, Underbite, and Fracture and his Mini-Cons—as both pursued the Decepticon fugitive Clampdown. Bee's team managed to capture all the Decepticons, but were forced to let them escape when Steeljaw broke free and set an unmanned garbage barge loose in the path of a riverboat. Drift and his Mini-Cons would later return to Earth and subsequently join the team. The team continued to capture escaped convicts. Bumblebee was once again contacted by Optimus with further warnings, shortly before Steeljaw and his pack managed to briefly seize the scrapyard; however, the Autobots managed to recover their base. The team soon gained another new ally in the form of the Primus-chosen female Autobot warrior Windblade, who aided the team in securing the fugitives Razorpaw and Zizza before departing. Unfortunately for Bumblebee and his team, the threat that Optimus had warned them of soon revealed itself as Megatronus, a disgraced member of the Thirteen. Having struck a deal with Steeljaw's pack, Megatronus instructed them to construct several devices he needed, which they did after capturing Strongarm, Sideswipe, and the returning Windblade. Bumblebee led the remainder of his team against them, only for Optimus arrive shortly before Megatronus made his appearance. Deferring to his former commander, Bumblebee became more concerned with Optimus' well-being and leadership than trusting in his own previous experiences. Fortunately, his team rallied behind him and gave him the courage to stand firm, which enabled them to capture Steeljaw's Pack after the would-be Decepticon tyrant was ejected from the battle by Megatronus. The Autobots then fought to prevent Megatronus from destroying both Earth and Cybertron, and managed it after discovering the latent powers of Bumblebee, Sideswipe, and Strongarm's Decepticon Hunters used in tandem and copying the sword form of Optimus' Prime Decepticon Hunter. With Megatronus defeated and possibly eliminated, the Autobots departed for home, with Bumblebee at last finding his rallying cry: "Rev up and roll out!" With Megatronus defeated and most of the Pack apprehended, Bumblebee questioned whether his fellow Autobots wished to remain with him on Earth. To a one they agreed, with Windblade and Optimus formally joining the team, though Optimus did so as Bumblebee's equal rather than his superior. Turning their attention to Decepticon fugitives still scattered around the globe, Bumblebee decided to split his team by dispatching Drift, his Mini-Cons, and Windblade to seek out Decepticons in other locations while the rest of the team remained at the scrapyard. At their own insistence Optimus and Sideswipe joined the team, which ended up stranded in the Arctic after Optimus' altered state damaged their Groundbridge. Unfortunately, the remainder of the team soon had to deal with another problem: Overload, a Decepticon who had previously infiltrated the Autobot ranks and caused Bumblebee to suffer serious injuries, greatly embittering the former scout. Bumblebee became consumed with bringing Overload in, even after the Mini-Con fugitives Backtrack and Ransack were freed during their initial battle; the two Mini-Cons subsequently joined forces with Overloard. Bumblebee appears in the episode "Bumblebee to the Rescue", where he helps the Rescue Bots and their human partners investigate a fallen meteor. Optimus Prime briefly assigns Bumblebee to observe how the Rescue Bots and the Burns family work together. Cody and the rest of the Burns family are unable to understand Bumblebee and requires one of the Rescue Bots to translate. The Rescue Bot Blades also happens to be a big fan of Bumblebee (who is said to be a legendary scout and war hero by the Rescue Bots). When Heatwave, Boulder, and Chase are infected by a substance contained in the meteor, Bumblebee, Blades, and the Burns family work together to destroy the meteor and obtain a sample in a hope to find a cure. Bumblebee and Blades successfully destroy the meteor and retrieve the sample, but at the cost of being infected as well, but thankfully the Burnses use an analysis of the meteor sample Bumblebee found, They are able to find a cure in the Autobots database, curing Bumblebee and the Rescue Bots. At the end of the episode, Cody is revealed to have learned how to understand Bumblebee. Before leaving, Bumblebee asks the Burnses (with Cody acting as interpreter) if they can take a picture of him and Blades. Bumblebee returns with Optimus Prime in "It's a Bot Time" and "Bots to the Future", where they go back in time to save the Rescue Bots from Dr. Morocco. They return to an alternate present with Dr. Morocco ruling Griffin Rock. They fight Morbots, while the Rescue Bots go into the city. They find out they left Dilther behind, which is how the Morbot army exists. They go back in time to take him back to the present, which is then changed back to the regular timeline. Bumblebee later returned in "Odd Bot Out", where he was sent to search for a missing Cybertronian artifact on Griffin Rock while Optimus searched the nearby seafloor. To the dismay of his biggest fan Blades, Bumblebee teamed up with Dani, who was temporarily unable to pilot Blades due to her pilot's license expiring. Bumblebee is an Autobot warrior, and is based on the Generation 1 version of the character. 'Sup? I'm Bumblebee, and I'm just about the coolest KREON character you'll ever meet. When I'm not punking the other AUTOBOTS, I like to spend my time cruising the freeway at top speed, hunting for the ultimate source of ENERGON. Hobbies: Pranking PROWL and speeding! Favorite Hangout: Anywhere there are lots of humans and loud music! Big Plan: To form a block-rockin' band. And also learn how to brick-surf. Kreon Bumblebee appeared in the animated shorts "Last Bot Standing", "Bot Stars", "My Ride is Better Than Your Ride", "The Big Race", "A Gift for Megatron", "Megatron's Revenge", and "Quest for Energon, Part 1". Kre-O Bumblebee appears in the flash video game Kre-O Transformers Konquest. In this game Kreon Optimus Prime attempts to avoid bombs and collect parts to rebuild Kre-O Ratchet, Mirage, Prowl, and Bumblebee. In the 10th installment of the Angry Birds series, Angry Birds Transformers Bumblebee appears. Here he is portrayed by Chuck (Better known as Yellow Bird). Bumblebee/Chuck will have two variations, one which is yellow with black stripes based on his pre-Age of Extinction look. And one that is based on his Age of Extinction appearance. Both resemble a Dodge Challenger in vehicle mode. Bumblebee is one of the main characters and the protagonist of Transformers: Cyberverse. ^ "Movie Review: 'Transformers: Revenge of the Fallen' brings incredible visual effects plus comic relief". The Chicago Defender. Archived from the original on May 22, 2010. Retrieved September 8, 2010. ^ "Transformers Hall of Fame Robots". Hasbro.com. Archived from the original on July 5, 2010. ^ "Part 1 - TFCon 2009 Voice Actor Script Reading". YouTube. Retrieved November 1, 2013. ^ "Prelude Comic". TFcon.com. Archived from the original on September 22, 2010. Retrieved 8 October 2018. ^ "Transformers Battle Circuit". Hasbro.com. Archived from the original on March 13, 2010. Retrieved April 17, 2010. ^ "Bumblebee Shirts & Costumes". TV Store Online. April 10, 2010. Retrieved December 5, 2014. ^ "Animation Corner: Transformers Satire For FrankTV". Doinkamation.blogspot.com. December 3, 2008. Archived from the original on July 8, 2011. Retrieved April 27, 2010. ^ Vejvoda, Jim (3 Nov 2018). "Bumblebee Voice Actor Revealed". IGN. Retrieved 3 Nov 2018. ^ "Battle Bios". Hasbro.com. Archived from the original on April 27, 2010. Retrieved 8 October 2018. ^ "Chevy Camaro Special Editions | Performance Cars". Chevrolet.com. Retrieved November 1, 2013. ^ "Transformers Set Visit Preview!". Latino Review. Archived from the original on June 6, 2007. Retrieved 8 October 2018. ^ "Transformers Movie Update: We Have An Exclusive Robogasm With Ironhide, Bumblebee, Jazz And Ratchet". Jalopnik. June 22, 2007. Retrieved June 23, 2007. ^ Huffman, John Pearley (June 10, 2007). "Driving the Transformers Beater Bumblebee 1977 Camaro". Edmunds. Archived from the original on October 17, 2007. Retrieved November 22, 2007. ^ Gregorian, Dareh; Cohen, Stefanie (December 26, 2007). "Giant robots stole my idea". The New York Post. Retrieved March 28, 2008. ^ "Driving the Transformers Movie Camaro Concept". Edmunds.com. Archived from the original on October 12, 2007. ^ "MichaelBay.com Updates: more Transformers 3 Interviews, Images and Bayhem". TFW2005.com. ^ "Our 10 Favorite CG Characters". Entertainment Weekly. July 17, 2007. Retrieved April 21, 2017. ^ "Rain of Starscream Part Deux". From the Tip. April 2008. ^ Roberto Orci (July 6, 2007). "Orci and Kurtzman Questions: Post movie". Official site. Archived from the original on September 28, 2007. Retrieved September 8, 2007. ^ "Transformers Cyberverse Battle Builder Game". Hasbro. Retrieved November 1, 2013. ^ "Transformers Animated (DS) Review". IGN.com. ^ "Latest Fallout gets closer to Hollywood entertainment". Coventry Evening Telegraph. November 14, 2008. ^ "Botcon 2008 Transformers... Unite". Tomart's Action Figure Digest. Tomart Publications. 1 (164): 32–35. 2008. ^ Troop, S. Trent; Sepelak, Greg (2008). Dungeons & Dinobots. Illustrator Evan Gauntt. Fun Publications. ^ Troop, S. Trent; Sepelak, Greg (2009). Do Over. Illustrator Yuki Oshima. Fun Publications. ^ Troop, S. Trent; Sepelak, Greg (May 1, 2009). Eye in the Sky. Fun Publications. ^ "2008 Figures". BotCon. Archived from the original on February 17, 2008. ^ "BotCon 2010 'Transformers: Prime' Panel Coverage". TFW2005.com. ^ "Learn How Bumblebee Lost His Voice in This Short Story from 'Exodus' author Alex Irvine". MTV.com. June 22, 2010. ^ Revealed in "The Autobits Edition" of Darkmount, NV. ^ Transformers: Prime episode 1, "Darkness Rising - Part 1"
^ "KRE-O TRANSFORMERS Last Bot Standing". YouTube. July 1, 2011. Retrieved November 1, 2013. ^ "Kre-O Transformers Bot Stars". YouTube. July 6, 2011. Retrieved November 1, 2013. ^ "KRE-O TRANSFORMERS My Ride is Better Than Your Ride". YouTube. Retrieved November 1, 2013. ^ "Kre-O Transformers The Big Race". YouTube. November 10, 2011. Retrieved November 1, 2013. ^ "KRE-O TRANSFORMERS A Gift For Megatron". YouTube. December 14, 2011. Retrieved November 1, 2013. ^ "KRE-O TRANSFORMERS Megatron's Revenge". YouTube. Retrieved November 1, 2013. ^ "Kre-O Transformers - Quest For Energon". YouTube. September 11, 2012. Retrieved November 1, 2013. ^ "KRE-O TRANSFORMERS Konquest Game". Hasbro. Retrieved November 1, 2013. Wikimedia Commons has media related to Bumblebee (Transformers).